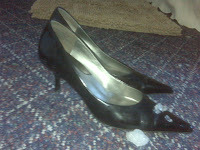 Vote Audrey: Black patent leather pumps are always the right choice in footwear. Black patent leather pumps are always the right choice in footwear. I tell myself this, because I had to trek up a hill in 16 inches of snow wearing black pumps. A little bit fun, a whole lot of painful. Had I known I'd be in for a winter wonderland, I may have opted for some snow boots, but where's the random in that? Stay tuned for a happy holiday post tomorrow; right now, I'll be thawing out my ankles.